Ask Kylie: Can I Paint My North Facing Room White or Off-White? You are here: Home / The Best Paint Colours / Neutral, Gray, Greige, Cream and White / Ask Kylie: Can I Paint My North Facing Room White or Off-White? Are you feeling frustrated with your north facing room? Does your exposure leave you feeling gloomy and depressed, under a gray (with a hint of blue) cloud? If so, then THIS is the blog post for you! North facing rooms can be a total bugger to paint and decorate – ESPECIALLY if you’re going for a light and bright look. However, once you understand what your north facing room needs, you’ll find it a lot easier to create a space that is inviting and well-balanced. Between the paint colour and the carpet, this room was screamin’ for mercy. Well, there’s indecent exposure (which is me on Friday nites after 3 glasses of wine) and there is the type of exposure that is outside your windows (also me on Friday nites after 3 glasses of wine). Exposure refers to the direction that the natural light is coming from as it comes through the window – north, south, east, west, or a mix of those. This is a great example of a north facing room with a warm white paint colour, and really it should be good – it’s my house! North facing rooms have a considerably cooler source of natural light compared to warmer, south facing rooms. This northern light casts a cooool gray light into the room, creating an unwelcoming and cold look if it’s paired with the wrong paint colour and décor. So how do you know what is right and wrong? What’s the difference between a good white and a bad white? And why does it matter – isn’t WHITE WHITE? White is the most reflective colour. So, in the world of LRV it reflects a lot of light back into the room and because of that, it also picks up a LOT of reflection from the environment. And…it can ALSO pick up the cool gray light coming from your northern exposure. If you choose a stark, clean white or a slightly cool-toned white, you risk giving your room a double-whammy – cold on cold. Your clean white paint colour will take that cool gray light coming in and RUN with it, giggling all the way, leaving you with a chilly-manilly space that is neither balanced nor inviting. These are whites that have a whisper (or more) of blue, green or purple in them. North facing light can enhance cool colours, so you can expect a slightly cool toned paint to look even cooler in a room with northern exposure. Now if you have the right amount of lighting (natural and interior) to support this, you could be okay, but it’s usually best to play it safe by choosing a ‘glorified white’ – a white with a touch of warmth in it to help balance out some of that cold gray light coming in, rather than compounding it with a cold white (that was a long sentence). So does this mean you should avoid ALL whites? No. In fact, if you really really want a cool, icy look (a la Elsa) you might just love a white with a hint of blue in it. And in fact, there is the odd duck who likes this look – that combination of northern exposure and stark white paint that gives an icy, kind of shadowed effect (I hear Elsa is a big fan). However, I’ve found that when I have clients who are looking for a nice white for their north facing room, they are looking to lighten and brighten. They want to add life without adding colour or overwhelming warmth. And the BEST way to do this is with…WHITE! Are you confused yet? Have another glass. Benjamin Moore Simply White is a bright, fresh, warm white. It has a wink of yellow in it – not enough to be obnoxious, but just enough to help balance out some of that gray light coming in, creating an overall ‘soft neutral’ effect. Timid White is a beautiful off-white with a warm yellow base, a great way to counteract the cool gray/blue northern light. In a south-facing room, the yellow in Timid White can come up stronger, however in a north facing space, I’ve found that the gray toned light coming in helps to soften the yellow, leaving behind just a soft, slightly warm colour. With an LRV of 82, you’ll see that this is certainly a light, bright, reflective colour – without acting like a ‘white’. Personally, this is one of my fave warm off-whites. Creamy has that yellow base that is nicely grounded with neutral undertones so it isn’t overly ‘colourful’ – just soft and warm. Liar liar pants on fire. Here I am telling you all about warm whites and I go and throw a cool white into the mix. It’s true. Why do I like Silver Satin? Well, it’s subtle and it’s not an icy cold blue or green-tinged white, in fact, it’s more of a light warm gray with a slightly feminine (ahem, purple) undertone. If I HAD to do a cool-er feeling white (compared to the cream tones) in a north facing room – this would be it, and in fact, I’ve recommended it to several clients. Why does it work? Well you know, sometimes you want to paint your home all one colour, which means you probably have to account for a multitude of exposures. And while I do prefer a warmer white in a north facing room, as you can see above and below, Silver Satin holds it’s own, even though it’s slightly cooler feeling in comparison to the warmer whites. I might not put it in a north facing room that also has east facing windows as the eastern light can further gray things out. If you have a north facing room that has very little natural light, I would not paint it white – any white. Why? Well, colour will not come to life without light, so not only will you be fighting the gray of your limited exposure, you’ll be fighting the gray of the shadows created due to the lack of natural light. If you have an awesome interior lighting plan, then fill ‘yer boots, but be sure that your space is well-lit before you commit to any type of light colour. So there you have it! Now of course there are MANY more awesome colours to check out, but hopefully, these whites get you pointed in the right direction. And while there’s a LOT to consider when figuring out which white is best for you (flooring, countertops, trim colour and more), but you know I’ve got yer back, so just holler if you need some help via my affordable Online Consultation and E-Design packages! Kylie – Your posts are always full of interesting information – not just paint colors, but light intensity and gradiations as well. Since I am currently furnishing a small North-facing bedroom with odds and ends to fashion it into a mix of boho and Mark Twain, I will soon be calling on you for the 3 pain color for $45 offer. Every time I see that offer I get so excited, yet I’m not ready to send you pictures. At this point, the room might be too masculine for me and I need to solve that problem before I proceed. I have walls covered with framed art, burgundy leather chairs, a large open secretary-desk, a navy twin mahogany bed, and MORE framed art. Boho pillows and plants soften the look. My birthday is the end of May and I think this will be my present to myself. Please keep putting out your fascinating newsletters concerning light directions and its effect on paint colors. Hi Ellen – you have a lot going on there! I’m looking forward to hearing from you when ‘paint time’ arrives! Thank you taking time to brighten my day! The burgundy leather chairs are going ,going ,gone! A friend is buying them for her hubby’s “man cave” and I am on the look-out for 2 chairs to replace them. I need to find a comfy chair for myself and one more if a friend visit. It’s odd that its both a bedroom and a sitting room, but all my friends enjoy the intimacy, music, and the art.. Pictures will be forthcoming. I love your recent post! Wahoo – peace-out to the leather burgundy chairs! You know, Pier 1 has some fantastic chairs. AND they have a few fabrics to choose from and you get the chair a week later! I find the scale of them to be ‘just right’. Can’t wait to see some photos! When we moved into our current home, the owners had painted a room with a big bay (north-facing) window a pale aqua blue color. We quickly learned that that very pretty aqua blue turned electric blue as the day wore on! We have since repainted with BM’s Winds Breath and have lots of whites and warm taupes in the room with some navy accents and it works well. There’s still a bit of a blueish/green cast right at dusk nut not during the rest of the day. If I decide to repaint in the future, I like the idea of the vanilla/creamy paint by SW. Thanks! Hi Charlotte, it sounds like you’ve had a bit of a challenge! I’m glad you’ve found some colours that work for you! If you need help down the road don’t hesitate to drop me a note! Great information, Kylie. It is a challenge to make darker rooms come to life with paint. Good principles to work with, however! Thanks Beth, that’s always good to hear! This post was very helpful – thanks. So, if Benjamin Moore Simply White is good for a north facing room, does that mean that it is too reflective for a room that faces south? I feel like you wrote this just for me LOL. I picked up swatches of all the colors you suggested in my consultation. I like them all! I’m going to give timid white a shot in my north facing room – I am so excited to brighten it up in there 🙂 Now I’m kicking around the idea of yanking the chair rail and going timid white all the way, or if I want to accent with the green. Thanks Nina – It’s always good to hear when you’ve ‘hit the spot’ for someone! I think accenting with the green is the way to go! Don’t forget to send pics! I stumbled on your website through Pinterest and love your articles about how to make north facing basements less dark and dreary. Thanks so much for such great information. I’m glad to see that you like Simply white, which I used on the ceiling and trim upstairs in my house. I’m probably going to use the same downstairs. Our house was previously owned by someone who loved pink, not light pink, but middle of the card pink/mauve. The ceilings, trim, doors, walls, grout, etc. were all painted this pink and we are slowly painting over it. Hello Kylie. Do you have any posts on what colours to paint North facing rooms. I have a sliding door and window across one wall and that’s all the light that comes into my lr/dr. I wanted to paint a greige. Was thinking perhaps Revere Pewter or Mindful gray but I don’t want my place to be dark and dreary. My furniture is white and couches beige. Do you have any posts on this. I saw the one on which white to use but I want something with a bit more personality than just white. Thanks! Kylie, I love your posts – so much information and great to know you’re available for in-depth consulting work! I’m about to paint my bedroom in Silver Satin – was happy to see it mentioned here! Do you have a go-to trim for Silver Satin? Rest of the house is White Dove trim, so I’m hoping that will work…we’ll see. Thanks for all the inspiration! Hi Barbara, I think that White Dove could be a great choice. Short of that, good old BM White (PM 2) is a nice clean and simple choice too! I love your posts, and have been referencing them for the past week as I choose paint colors for a newly finished basement. Can you recommend a nice white for our basement bedroom, which has a small window but will be well lit with two recessed lights (bright white, 650 lumens each)? I already chose my bathroom and rec room colors (based on your suggestions). Thanks! I just read your advice about what colours of white to use in a north facing room. What happens to BM Palladian Blue in a north facing room? I know it looks great all day long in a south facing room and I don’t think it will look great in a north facing room but I can’t explain why to myself. I will be in touch to hire you. 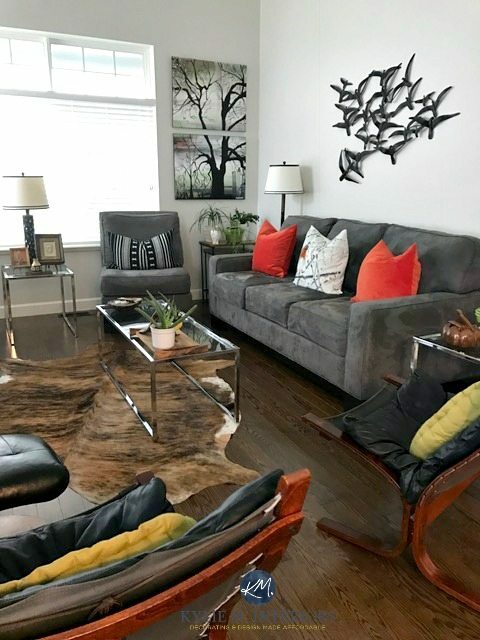 I need help in finding a condo sized coffee table (less than 40″ wide) for a great room where I want to create a specific look which I believe depends mostly on the coffee table. Just found this blog tonight. Are your prices in CAD$? Looking forward to working with you. Thanks. Hi Heather! So I’ve found that with cool colours, when you put them in a north facing room – which has a cool gray with a tint of blue light coming in, that it can enhance the cool tones. So, Palladian Blue is likely to look a bit more blue and chilly and will lose a bit of that nice balance that it has. As for shopping online, I don’t do too much of that anymore and am more focused on paint colours, but I’d be happy to take a look at your room! And yes, if you decided to buy a package, you would just let me know which one and I would invoice you in CDN! I love the dark accent wall in the girly room with Simply White. May I ask what color that is? Simply White is such beautiful color. I think I’m going to ask you where it can work in my home when I consult you next time. Hi Julie! I think that was Benjamin Moore Black 2123-10 (they got really creative with the naming of that one 😉 I did it in eggshell finish, but I wish I’d done flat or matte. Even eggshell in dark colours can be a bit abrasive looking. What about a room with THREE exposures? My combo living/dining/kitchen has great windows up to the 12′ ceilings. 3) and the third overlooks some of the trees, some street and some buildings (southeast and south). How do I treat a big room like this? Thank you! Hi Amy! Sounds like you’re lucky and have a nice range to balance things off a bit. I can’t say that I would base it on one exposure at all and would just in general, find a colour that suits YOU and your interior products. It will naturally shift from wall to wall, and as the day progresses, so you might find a more neutral colour easier to manage than a colour. What paint finish do you generally recommend for a bedroom. I usually do an eggshell finish but curious what you think. On my “honey-do” list is the task of painting a bedroom that only gets northern light so I’m leaning towards one of the white tones you have suggested but not 100% sure if I should stay with eggshell finish. Love the site and the info you offer. Hi David – Eggshell all the way!!! Hi Shelly, I’m so glad! That’s actually Benjamin Moore Steel Wool – if you look in my portfolio under my kitchen/entryway you’ll see it there too – it’s one of my FAAAVES. It’s a gray with a kind of blue/purple undertone that is vague and OOOOH so pretty. HI Kylie! Could you share what color you used in the photo that you said was your own house? It’s exactly what I’m looking for in my north facing living room! Thank you so much!! I live in an 1850s Greek revival home with the orginonal wallboards in our northern exposure family room. It’s a large room with two original windows that are 9 Feet tall. The ceilings are over 10. Feet. I made a mistake on a color when we remodeled and I am trying to get it straight now. I used SW NEUTRAL GROUND. Want to cozy this room up. All the trim is velvet white. Can you provide some direction? The floor are all hardwood with sea grass rug. Hi Kyle, what is your opinion about SW Marshmallow, or SW Pearly White for a North facing room with not much natural light? I love your website and information! I recently bought a sample pot of Alabaster White. I painted some bristol boards and put them in different areas of my condo. I noticed that it has a cool, grey undertone and goes blue in areas of lower light. When I compare it to the paint card from the store, the paint card is a lot warmer and creamer. Online reviews say Alabaster is warm and creamy. Is it normal that my paint sample is cold and is different from the paint swatch? That is weird Barbara as yes, Alabaster is soft and creamy! Now in a northern space it can certainly pick up a bit of the lighting coming in, but the swatch would do the same thing. I’m thinking that perhaps it wasn’t a good sampling…which I have had happen. We have painted our master bedroom 3 times now, please tell me I’m not the only one!? It is north facing with not a lot of light. Currently it’s painted agreeable gray, with the dresser and night stands painted urbane bronze. Everything looks so dark, no contrast 🙁 Thinking alabaster. What are your thoughts? Any other suggestions? I really appreciate your blog, advice, & style of writing! 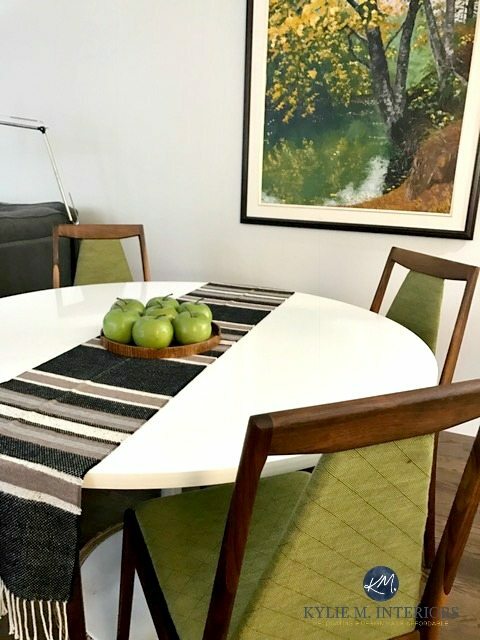 I have a north facing dining room with a lot of deep, natural wood trim (built in 1930s) and I tried a couple of swatches of Silver Satin around the room, and while it does “brighten” the room it comes off kind of dingy (not the look I want for a dining room where we eat everyday). I’ve noticed on other post about adding 4 oz of white pigment to different colors to counter act the dingy factor, do you think that could work with Silver Satin? Hi Rebekah, yes, adding 4 ounces can just slightly clean up colours! Will it be enough to help in a north facing room? Probably not. It might be more about your northern light and less about the colour… 🙂 Have you thought about going a bit warmer, ie: White Dove? Hi Gina! If you want a slightly softer, not ‘bright’ white look, then White Dove would certainly do the trick! Creamy however, is more of an off-white that has more yellow/creamy body to it and I wouldn’t do it everywhere. Something slightly warmer/softer than White Dove would be SW Alabaster… 🙂 If you do need help I have my E-design services so that I can look at photos of your home! Hi Kylie, I just recently discovered your blog and have learned so much. Thank you for all your great advice. We are building a new home that has an open concept. The house faces due north so many of the main rooms will be north facing so I have been working on researching colors that might work in north facing rooms over the course of the past few months. I (stupidly) assumed we would be using Benjamin Moore paints but I just found out that my builder only uses Sherwin Williams paints. Is there a way to cross reference colors that I like in Benjamin Moore to find out what the nearest match would be in Sherwin Williams? Thanks for your help!